To celebrate our record setting 10.72 quarter mile pass in our INTENSE TT G8 GT, INTENSE is offering a flat rate UPS Domestic Ground Shipping of $10.72 for any size and weight. Get your heavy items like an APS G8 Twin Turbo kit or 3800 Torque Converters or any of the exhaust systems we offer shipped via UPS Ground for only $10.72 to anywhere in the lower United States. This offer is good until May 10th, 2009 so be sure to take advantage soon. Many people have questioned when we would be able to add TCM updates to our INTENSE G8 ECM Tunes. We’ve always been able to do these updates if we had the car here at the shop or if the customer already had HP Tuners but remote TCM updates were not available. This changes with the addition of the HP Tuners VCM Suite to our INTENSE G8 ECM tune package. For $600 you get our INTENSE G8 ECM Tune & HP Tuners Package which includes the HP Tuners VCM Suite, allowing for unlimited updates to your G8 and the ability to log any supported ECM parameter, along with our INTENSE G8 ECM/TCM Tune. We don’t lock our binary files so you have room to grow with your modifications and can make tweaks and changes at your leisure. The HP Tuners VCM Suite comes with enough credits to license two vehicles. When you purchase the INTENSE G8 ECM Tune & HP Tuners Package we will ship you the HP Tuners VCM Suite and once you install it on your laptop or PC you can read the car’s binary file and email it to us. We will then modify your actual code and email it back to you so you can upload it to your car. No security relearn or crankshaft relearn will be needed and because you save your stock binary file you can revert it at anytime for warranty issues or diagnostics. 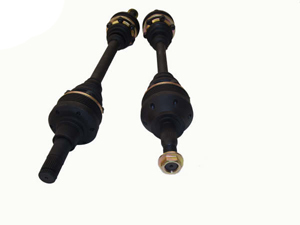 The Drive Shaft Shop Rear Axles for the Pontiac G8 are now available! INTENSE was the first to offer The Drive Shaft Shop’s stronger axles for the LSJ powered Cobalts years ago and now we are proud to bring you the same quality, performance and dependibility for your Pontiac G8 GT or GXP. The Drive Shaft Shop G8 Rear Axles feature custom Inner/Outer stubs that will fit the stock hub and differential. They are made from a proprietary material and are designed with one thing in mind POWER. This set of axles uses Porsche style 108mm Cross Groove joints but the strength doesn’t stop there. The internals have been upgraded to a higher grade chromoly and they have made one axle larger in diameter like the new Corvette. This allows the axles to twist and release at different rates instead of letting them both wrap and release at the same time. This technology will result in little to no-wheel hop. so when your ready to hit the track think of engineered parts from The Drive Shaft Shop available now from INTENSE! We can’t stop giving stuff away this month! First an APS Twin Turbo kit, then a $1000 cam package now now another G8 ECM. Congratulations to Ray St. Pierre in Larose, LA! He is our latest winner in the INTENSE ECM Lottery. Every 25th PCM/ECM (or PCM/ECM Tune-Up or Binary File) purchased from INTENSE™ will be free.